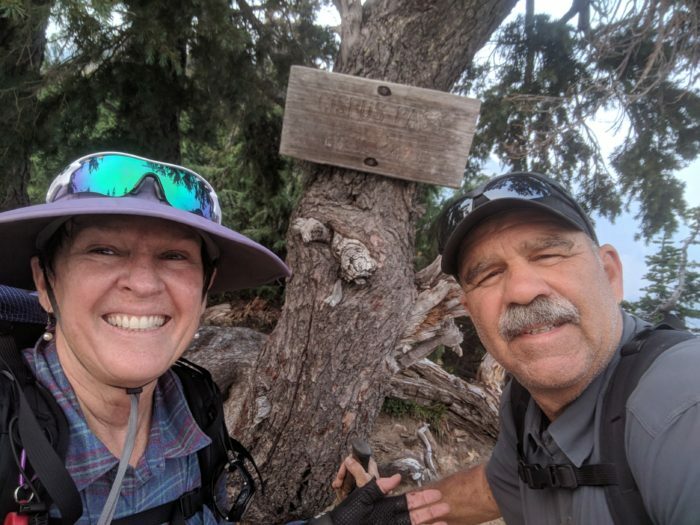 If you are section or thru-hiking the Pacific Crest Trail (PCT) in 2019 (or know someone who is), you’ll want to read, bookmark, or print this story to note some trail angels that confirmed they will be angeling in 2019. These trail angels want you to visit them and/or reach out for any support you may need during your hike. The Trek surveyed well-known trail angels, some met by the writer on her thru-hike and others listed in online resources (e.g., Facebook’s PCT Trail Angel page, Facebook’s Pacific Crest Trail Angels page, and trailangellist.org). We sent a survey to 84 trail angels and we heard back from 34 trail angels in these responses who confirmed they are angeling in 2019. (See a condensed version of the list below with location and contact info, at the end of this article). Trail angels Donna and Jeff Saufley run Hiker Heaven, a stop at Agua Dulce (mile 454) where hikers can sleep, stock up on water, do laundry, send mail, resupply in town, repair/sew broken gear. and even get rides to REI. This list includes helpful information for hikers (and loved ones) to meet and utilize these trail angels throughout a thru-hike or section hike on the PCT in 2019. This list is not to be the definitive or exhaustive list of all the PCT’s trail angels–that would be impossible and would spoil some surprises along the trail. It does include information that these angels shared directly with us, including their location (state, mile marker, trail town), the type of trail angeling they provide (housing/camping, food, receiving packages, stocking water caches, rides to trail, etc. ), contact info (email, phone number), and other interesting information (number of years as trail angel, personal history as a trail angel). *If you are a PCT trail angel who would still like to be included in the list, you can still do so by completing the survey here. Barney “Scout” and Sandy “Frodo” Mann are two of the PCT’s most well-known, longtime, and generous trail angels. 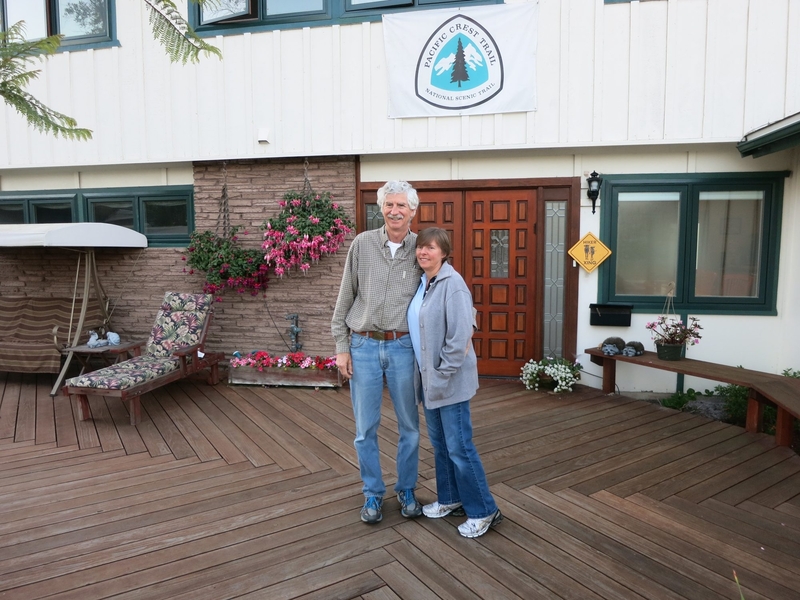 After their own PCT thru-hike, they began opening their home (pictured) in San Diego, CA, to host, feed, and drive hikers to the trailhead in Campo, CA, to start their northbound (NOBO) hikes. Trail angels on the PCT provide countless forms of trail magic and generosity for hikers, including offering their yards and homes for camping/bunking, rides to and from the trailhead, food, shelter or respite from the elements, receiving resupply boxes, leaving trail magic at a trailhead, stocking water caches in the desert, or even allowing you to fill up on water at their home.The latter is one of the most necessary, thankless, and anonymous gestures of trail magic on the PCT. Water caches like this one are stocked by trail angels–many whom hikers never see or meet– at several points in the Southern California section of the PCT (700 miles). 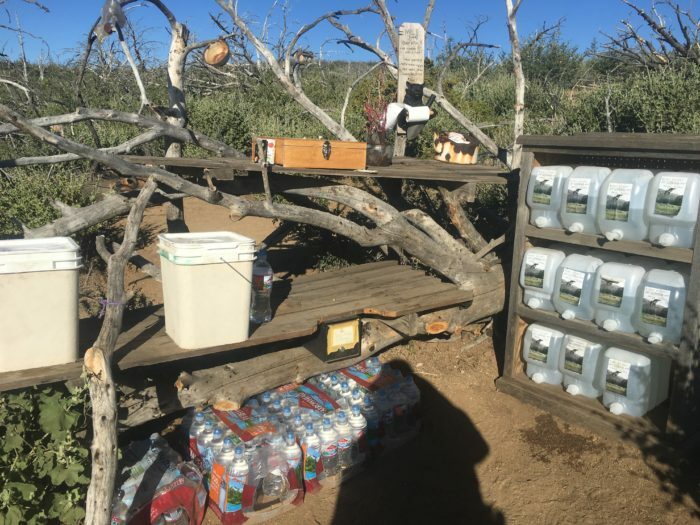 The desert is dry and scarce for natural water sources and trail angels are vital for stocking water caches and offering their homes or businesses as places where hikers can fill up on water (for free). Trail angels helping with water in the desert are a lifeline to hikers. In addition to this list, The Trek encourages hikers to utilize resources like Facebook groups, the comments feature in the Guthook app, trailangellist.org, hiker blogs, word of mouth, and even signs and posted in trail towns. There are so many ways to find trail angels on the PCT when you need or want to find them. Keeping your ears and eyes open and asking around will help, too! Aside from these trail angels, hikers are guaranteed to meet trail angels on the PCT not listed here. Many angels don’t plan on being trail angels until they meet a section or thru-hiker and learn of the opportunity (a ride, hosting a hiker at their home, offering a home cooked meal, stocking a water cache, etc.). You can read more guidance from the Pacific Crest Trail Association’s (PCTA) on their page on trail angels and trail magic. For new angels, we encourage hikers to help them understand how to be known by other hikers should they want to be (e.g., adding their name to online lists mentioned above, in Guthook’s comments feature, or placing a flyer in town). Mama Bear (center), her husband (left), and Ice (right) are longtime PCT trail angels who provide trail magic under I-10 near mile 209.5, set up camp chairs and offer food, water, baby wipes and “other things hikers like” at different times during the hiking season. Mama Bear also offers each hiker a “hug from Mama Bear,” as she did to me in 2017. Anyone can be a trail angel for a day, a season, or longer. No application. No prerequisites. If you are a hiker (not thru-hiking this season), a loved one of a hiker, a non-hiker, you too, can be a trail angel this season or anytime in the future for the PCT or any trail. Trail angeling is an opportunity to give back, find connection with great people, and be a part of something meaningful if even just for the cost of a case of soda or a ride to town. If you are not near the PCT, we encourage you to feel empowered and invited to provide an act of trail magic or trail angeling at some point if the opportunity arises. It just might change your life and another hiker’s. The relationship between hikers and trail angels keeps a tradition of friendship, magic, and karma alive. Trail angels often say the act is one that rewards the giver as much as the receiver. And hikers often say it is the thing that restores their faith in humanity. The Trek’s 2019 PCT Trail Angel survey, websites mentioned in this piece or any resource in PCT trail towns (e.g., gear outfitters, trailhead sign boards, libraries, bars, restaurants, churches, post office) are easy ways to advertise a trail angel, too, with a basic flyer. Trail towns like Wrightwood, CA, and Bend, OR, even maintain flyers at the trailhead and in town listing lots of trail angels in town. If nothing else, smile when you meet a hiker and ask, “How can I help you?” These are magic words to a hiker. You will make their day, maybe even their hike, and you’ll get to know another part of the PCT and the community around it. 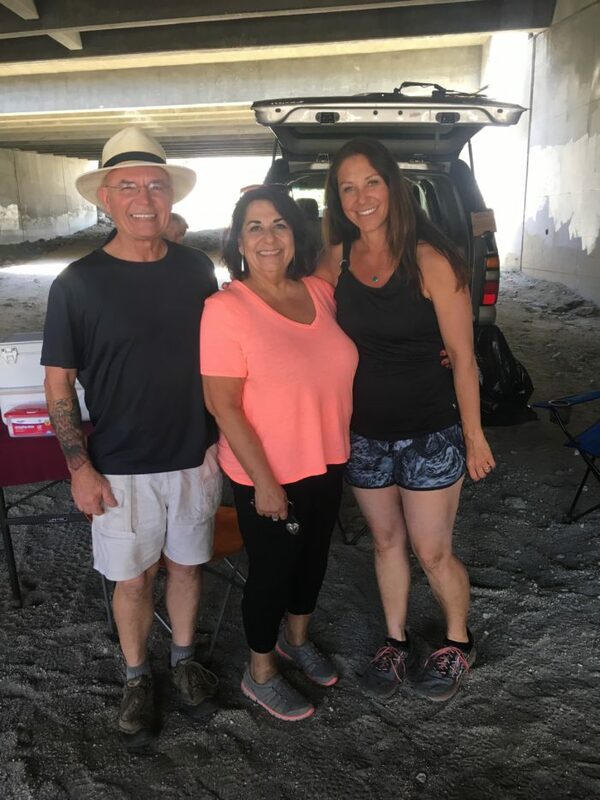 Dr. Jana “Cinnabun” Mulvaney (blue tank top) is a trail angel who stocks 300 to 1,000 liters of water at a cache in Southern California. She will support hikers anywhere between miles 600 and 704 during the season should they need anything. The Trek’s list, below, includes many longtime, legendary trail angels (Scout and Frodo, the Saufleys, the Andersons, Jerry Dinsmore and Ravensong) on the PCT who bookend the southern and northern stretches of the PCT. These iconic angels are cornerstones of the PCT, a network and tradition of trail angels and ongoing fountains of generosity for hundreds of hikers each season. 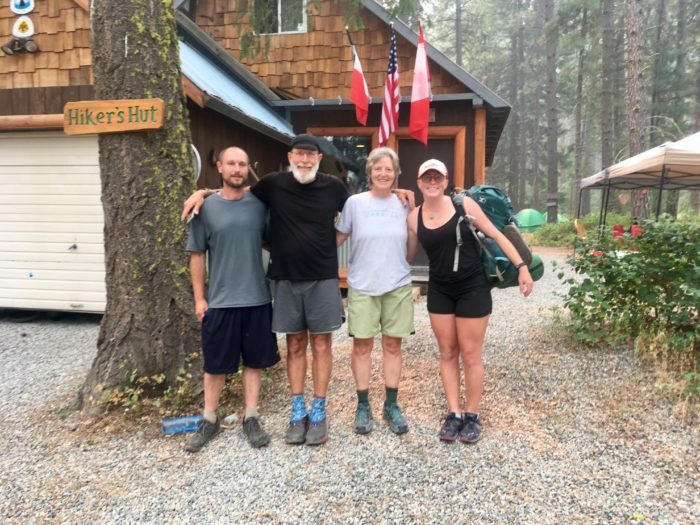 Their support is especially important because Southern California and Northern Washington are mentally arduous and physically dangerous due to weather and water while also being critical times on a thru-hiker’s journey—the beginning and the end points of the trail. Trail angels Donna and Jeff Saufley run Hiker Heaven, a stop at Agua Dulce (mile 454) where hikers can camp in their yard, stock up on water, hang out, do laundry, send and receive mail, resupply in town, repair/sew broken gear, and even get rides to REI. Not pictured are their large patio area and garage for hanging out, and an indoor area for showering, relaxing, playing music and watching movies. In southern California, Barney “Frodo” and Sandy “Scout” Mann typically host upward of 1,000 hikers in San Diego between March and May for the start of their hike; Donna and Jeff Saufley of Hiker Heaven host up to 50 hikers per day between March and June; Terrie and Joe Anderson of Casa de Luna in Southern California usually see hikers the day before (for SOBOs) or day after (NOBOs) for the Saufleys and allow camping in their forested backyard, serve a taco salad dinner, a pancake breakfast and provide lots of laughter each night. The Manns, the Saufleys and the Andersons told us that the next two years (2020 being the last) will be their final years as trail angels in order “…to make room for new angels,” said Donna Saufley. Carolyn “Ravensong” Burkhart is a legend herself as the first known woman to solo thru-hike the trail in 1976. She gives back by hosting hikers at her home and an adjacent building known as Ravensong’s Roost where hikers can camp outside under the stars or stay indoors. A major force behind the warmth and friendship on the PCT is trail angels. Their acts and personalities inject kindness, selflessness and generosity onto the trail and a lasting impression that hikers then put back into the world. The majority of the PCT’s angels and those we heard from do so for free and simply out of the kindness of their hearts. Many spend large sums of their own money, gas, and time to support hikers. Similar to Leave No Trace (LNT) or any best practice on trail, The Trek encourages hikers to stay grateful and gracious to trail angels before, during, and after your hike. We suggest taking pictures to remember the faces of trail angels you meet–you will be glad to have photos for memories, stories and maybe to send a “thank you” postcard at the end of your hike. Collecting their names and contact info is a helpful way to keep in touch. Trail angels often say they love getting postcards or hearing from hikers after their hikes are complete. Sometimes hikers even establish lasting connections with trail angels or develop a chance to pay-it-forward. 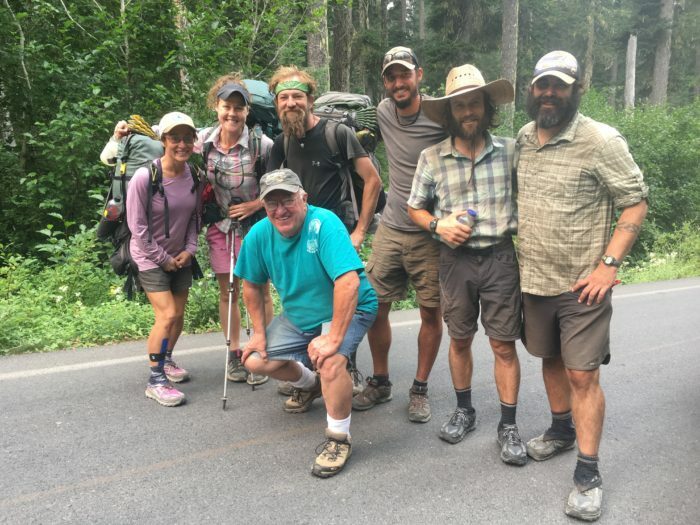 Doug Anderson, a retired choral teacher (kneeling) is a longtime trail angel in Trout Lake, WA, on the PCT who does one of the most vital and common forms of angeling: shuttling hikers to and from the trail. Like many trail angels, I found his name on a list of trail angels in the Trout Lake Grocery. The trail angels we heard from are below in a condensed version of this master list here (link includes more details from each angel). Service(s): Providing house/camping in our backyard/host at southern terminus; pack shakedowns; dinner/breakfast provided; rides from San Diego Airport to our home in San Diego and to southern terminus trailhead in Campo; accepts packages by mail (see here for address). Service(s): Rides from San Diego Airport or to hiker’s hotel; rides to southern terminus in Campo. Also provides rides within the San Diego area, pack shakedowns or hiker chats over beers at local breweries. Service(s): Set up chairs, shade structure, provide food/drinks/first aid/supplies; accept packages by mail (see here for address). Service(s): Provide housing; allow hikers to stay or camp, use showers. As a fellow traveler, Westfalia van owner and camping enthusiast I enjoy helping the hikers. Service(s): Hostel hosting 500-1000 hikers per year. Providing rides to and from to trailhead each morning. We are a commercial lodge open all year but cater to PCT hikers during peak season (April – mid-June). Service(s): Provide camping at our house/property. Service(s): I have a huge yard available for camping and a car for rides. Up to 6 hikers can also reserve our cabin. Service(s): Rides from bottom of Mount Baden Powell/Inspiration Point to Wrightwood town post office/hardware store. Helps hikers also find lodging and resupply locations in town. Assists day, section and thru-hikers. Service(s): Providing housing in town for hikers to stay overnight. 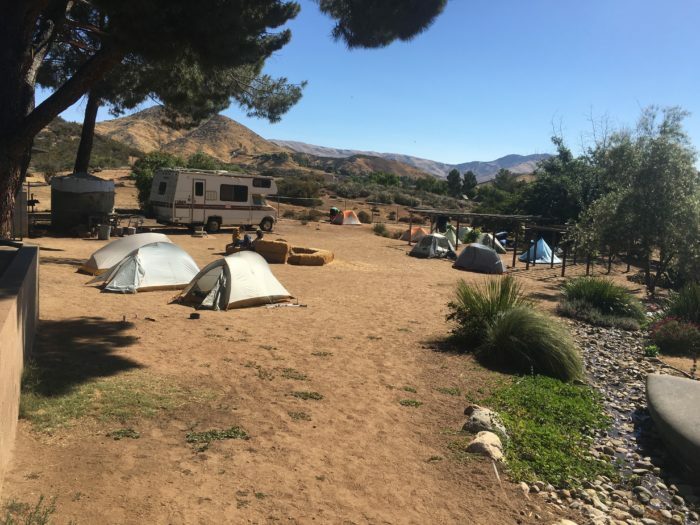 Service(s): Provide camping at our house/property; rides to town for resupply; laundry, gear repair, receive mail/resupply boxes; large area for hikers to relax, socialize, play music, camp and stay for a night or two. Service(s): Provide camping at our house/property; taco salad dinner and pancake breakfast; large area for hikers to relax, socialize, play music, camp and stay for a night or two. Service(s): Provide occasional camping at my house/property (including meals, laundry, private bath for two), transportation and small yard for camping. Hosting is for women or committed couple only, depending on advance notice by email. Service(s): Passing on kindness from strangers, that I received, when I was a weary traveler. Service(s): Provide rides to/from trail. Service(s): My kids and I love the hiker community and volunteering to help. We host hikers for the night and want to make a positive difference in the lives of the hikers we meet. 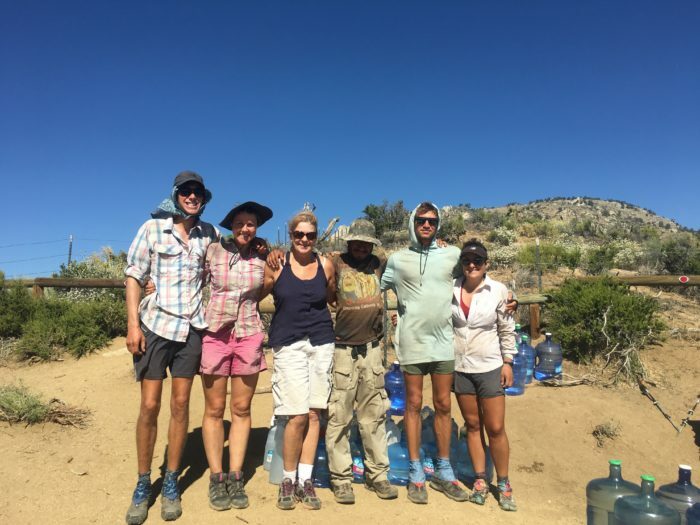 Service(s): Stock water caches; rides or other support for hikers in need between Tehachapi (NOBO mile 560) and Kennedy Meadows South (NOBO mile 704). Service(s): Rides to and from Kennedy Meadows North. I also hand out my HIPPIE STIX GRANOLA BARS to ALL hikers I meet; provide food, drinks and powdered drink packs to all hikers I meet or in need. Also provide some medical and first aid for hikers who need it. Service(s): Trail Magic; feed hikers and provide rides/camp chairs to relax during trail magic. Service(s): Feeding hikers. We have options for herbivores, carnivores, gluten free and vegan hikers. We have a crew that sets up BBQs, pizza ovens and hot gourmet food in the middle of nowhere. Look for us! Our Goal is to create some “space” for hikers by offering solace in a comforting environment, fresh, nutritious food and cold drinks. We do not accept donations from hikers but always welcome it through families, outside individuals and companies. Service(s): Food, medical assistance if needed and rides to and from town and trail. I hike through around Fourth of July, when many PCT hikers come through our area, and hand out fresh strawberries, tangerines and slices of cheese and crackers. My brother David Odell was one of the first people to thru-hike the PCT. He later hiked the Continental Divide Trail (CDT) and Appalachian Trail (AT), too. Service(s): Provide rides to/from trail — ranging south to Ebbetts Pass (mile 1046 NOBO) and north to Donner Pass. I also allow hikers to stay/camp overnight at my home in Placerville; accept packages by mail (see here for address). Service(s): Filling hiker boxes, some rides, helping with logistics by saving offers, names, other angels and sharing the info. Service(s): Hiker feed on trail. My husband and I camp out on the weekends on trail that we can and bring food to ring enough food for a small army of hikers; spent the night and serve dinner and breakfast to hikers. Service(s): Follow the NOBO herd giving rides and stocking water caches as necessary, jumping up from Southern California (Socal) to Oregon around July 4th, continuing as circumstances dictate (e.g. wildfire season). Service(s): Allow hikers to stay/camp overnight up to 2 nights at my home in downtown Ashland. Showers, laundry available and walking distance to post office and grocery. Service(s): Provide camping at my house/property and showers, laundry (with loaner clothing), rides around town, sometimes beer and snacks, and have a hiker box – 2 night maximum with 6-8 people capacity. Service(s): Provide ride to/from Santiam Pass. Offer food,water & soda. Allow hikers to stay/camp overnight and shower. Beds available for limited number of hikers. Service(s): Provide rides to/from trailhead, accept packages by mail (see here for address), laundry service, provide rides to/from trailhead. Occasional hot food and cold refreshments at Santiam Pass trailhead. Will post on trail angel Facebook page the dates when I will do hiker feed trail magic. Service(s): Allow hikers to stay/camp overnight; provide rides to/from trailhead; accept packages by mail (see here for address). I do any and everything for the hikers. Service(s): Provide rides to/from trailhead; mostly provide food and drink and rides sometimes, as needed. I’m a full time RVer and move north with the bubble roughly from Bend, OR to Rainy Pass, WA over 2 months. Service(s): Allow hikers to visit or stay/camp overnight at the end of their NOBO journey or the start of their SOBO journey. PCT and Pacific Northwest Trail (PNT) hikers can stay overnight inside at the Hiker’s Hut, too, or camp outside. The “Roost” is a free (but donations are appreciated, to help pay for a enhancements to the facilities including a washer dryer for hikers) place to camp or stay indoors, retreat from rough weather or wildfires and to learn alternate routes to help you safely complete your journey, if need be. The Mazama Store is next door with baked goods and homemade soup along with Goat’s Beard Mountain Supply offering hiking and mountaineering gear and accepting resupply packages (Goat’s Bear Mountain Supplies, c/o Hiker Name, 50 Lost River Rd., Mazama, WA 98833). I love meeting and helping other PCTers and feel honored to do this! It’s a real joy to me and our community, which gets more and more excited each year. The Roost is used as a base camp for folks doing trail magic at Rainy Pass and Harts Pass. Service(s): Hikers are welcome to Hiker Haven — camp outside or stay indoors in a bunkhouse, to cook, do laundry, borrow loaner clothes, bedding and shower. Providing rides to the Skykomish Post Office to pick-up resupply boxes, to the local restaurant and every other day for a ride to the grocery for resupply. Firewood and fire pit for bonfires, BBQ available and burgers usually available from Jerry. Donations are appreciated to keep things running. Last fall, The Hubs was waiting to pick me up on US 2 in Washington. He knew he had a few hours to kill, so he spent the afternoon ferrying through hikers between Stevens Pass & Skykomish, and making sure they knew about the Mountaineers’ Lodge & its gear-drying room. (It was incredibly wet last September, and every thru hiker I encountered told me all of their gear was soaked.) Health issues mean he can no longer hike himself, so being a trail angel for an afternoon was a chance for him to reconnect with an area he loves. I’ve been the recipient of trail magic, and I know how grateful hikers are when they encounter it, but those of us who act as trail angels are thankful for the opportunity to do so. I plan to hike sections of the PCT in Washington this summer, and that will involve him picking me up & taking me back to where I left my truck. I imagine he’s already looking forward to having smiling, stinky strangers riding in his car with him.